Soak beans overnight, or use the quick boil method. Either way works great, so if you forget to put the beans on to soak before you go to bed, don’t sweat it! I usually just use the quick boil method. Rinse and sort through the beans looking for any stones or foreign objects. I admit. I have done this all my life and never once found a rock or stone so they must do a pretty good job sorting or else I’m just real lucky. But, it’s probably a good idea to do it anyway. 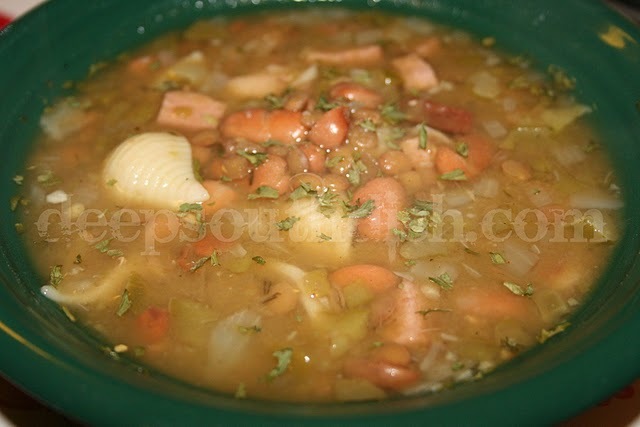 Place beans into a stockpot, cover with water plus about 1-inch over and bring to a boil. Boil for 2 minutes, remove from the heat, cover and let sit for an hour. Drain and return to pot and add 2 quarts of fresh water. Place on stovetop and bring to a boil. While you’re waiting on that to come to a boil, go ahead and add the ham, onion, bell pepper, celery, garlic, jalapenos, black pepper, thyme, tarragon, savory and bay leaf. Do not salt the pot!! You’ll do that at the end along with the Cajun seasoning. Reduce heat to a low simmer, and continue cooking partially covered (I just crook a lid on top) for up to 2 hours or until beans are tender and soup has thickened to desired consistency. Add the pasta, salt, and Cajun seasoning. Cook an additional 10 minutes, or until pasta is tender. Taste, and adjust seasonings as needed. Serve with a side of this marvelous Parmesan Garlic Toast – just delish!